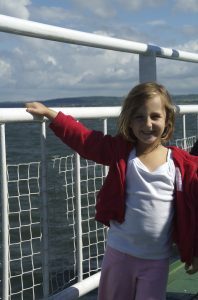 A few years ago, we took our then 4-year-old granddaughter, Anabel, on a trip to Ireland. High on the touring list was visually memorable places, fun for little ones and lots of music. Our particular 4-year old loves music and dance so the latter was very important. 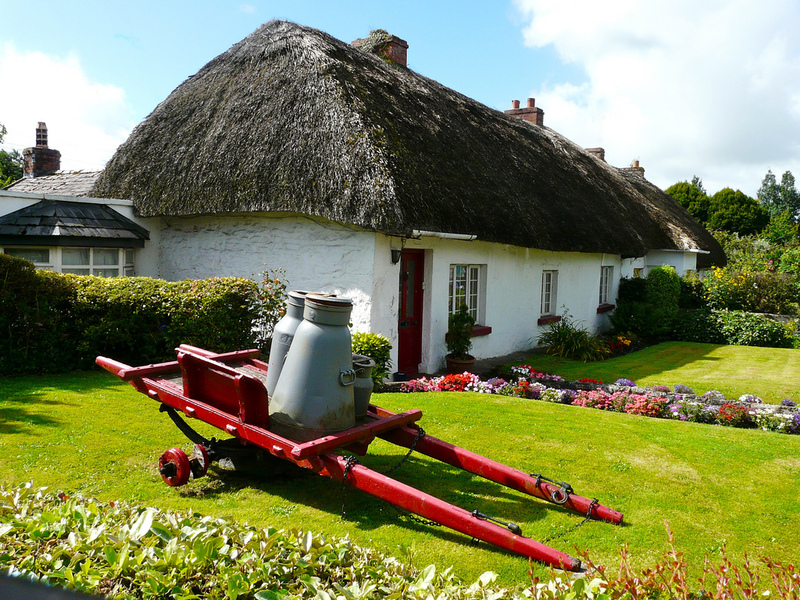 Having been to Ireland many times before, we planned strategically placed B & B’s to minimise evening travel back to a cozy place to get a good night’s rest. We chose the Shannon area as a base, with an additional overnight stay in Killarney for our Ring of Kerry sojourn. Our daughter and granddaughter arrived at the Shannon airport 5 hours late due to flight delays but still ready to go. Our day started at noon on Monday. Planning a light day to accommodate jet lag, we choose to take the car ferry out of Kilrush across the Shannon to Tarbert. After lunch in Kilrush, we caught the next ferry and started our adventure. On the crossing, the Shannon dolphins were kind enough to make an appearance and enhance our little one’s first ferry ride. If the weather co-operates and you have more time there are also dolphin cruises that go out of the Kilrush area. Since Anabel still had a good bit of energy we headed along the scenic Shannon coast road to one of our favourite museums in Foynes, The Foynes Flying Boat Museum. Here you can capture one of the most romantic eras in air travel. Foynes was the last terminal the Boeing 314 Flying Boats stopped at before they headed across the Atlantic in the 1930’s. It is also the birthplace of Irish coffee. Passengers landing on the Shannon from the long haul across the Atlantic disembarked to the cool mists of Ireland and needed a bit of warming up. This museum has fun for all. You can see old movie clips of the flights in their theatre. The only reproduction in existence of the 314 can be toured. Our little one enjoyed roaming through the plane, trying out the sleeping bunks and sitting in the captains chair. On leaving the plane there is a play area for the little ones to practice flying with a miniature cockpit and a simulator for the grownups to try while the children play. And don’t forget to have an Irish coffee or a hot chocolate on the way out. That night we had dinner at the Lantern Inn (very kid friendly!) and headed to our favorite B&B Kilteery House. Our next day was full of castles and music. In the morning we drove a bit north to the Bunratty Castle and Folk Park. This is a delightful place for both children and adults. It is a park including buildings reconstructed from throughout Ireland to give the visitor a sense of Ireland’ s past. Most of the folk park is geared toward the late 1800s. There are costumed people relaying the heritage and Anabel enjoyed watching a 19th century school marm conducting classes. People playing musical instruments, making pottery, cooking Irish dishes are all on offer here. There are also good places to eat. The highlight for Anabel was the 15th century Bunratty Castle, where she was able to have the run of the castle exploring the turrets, great hall and even the dungeons. After a full day, we headed to the beautiful little town of Adare to have dinner at the thatched roof, Inn- Between restaurant and an evening of music. The music and dancing was performed at the Heritage Center. Here we experienced an Irish Seisiun–Gaelic for a gathering of musicians. Anabel loved the violins and concertinas while viewing the dancers. There was even room in the aisle for her to dance along. On day three we ventured further into county Clare to the famous Cliffs of Moher and the Alliwee Caves. We were amazed at the developments at the Cliffs since our last visit there several years ago. Now there is paid parking, a paved walking trail and a visitors center with exhibitions. Quite a bit to occupy both young and old. The highlight, of course, are the much photographed Cliffs. After a bit of morning rain, the heavens blessed us with glorious sunshine and spectacular views. Anabel enjoyed running along the path picking wild flowers and exploring the castle at the north end. The visitor center has an extensive lunch cafeteria where we stopped for refueling before we moved on to the caves. The Alliwee Caves are most enjoyable for children. You get a guided tour which educates you as to the geological formations and gives you insight into the uses of the caves by man and beast over the centuries. Anabel was quite impressed with her first ever visit to a cave. From here we drove over to Knappogue Castle for a medieval dinner in the great hall of the castle. This was extremely well done with costumed ladies in waiting, kings and lords. The entertainment was superb and the food very nicely presented and tasty. The ladies sang, played instruments and danced, giving us a musical view of the main areas of Ireland. They were even kind enough to seat the families with children close to the stage and provide the little girls with princess crowns. (Bunratty Castle also does a medieval dinner, but having been to both we think Knappogue was superior). After the performance it was back to the B&B. Having enjoyed the pleasures of county Clare, we decided to next sample county Kerry in the southwest of Ireland. This is home to the lovely town of Killarney and the famous Ring of Kerry. The Ring is a wonderful drive around the southwest peninsula with many scenic views. Many of the best sights are within striking distance of the town so we choose to stay at a B&B close to town and venture out from there. One of our favourite views in the area is a place called Dunloe Gap. And at the base of the gap is a little restaurant, Kate Kearney’s Cottage. Here we stopped for lunch before we explored the gap. The best views of the gap can be seen from the Dunloe Castle Hotel. It has beautiful grounds and is well worth a visit. Having stayed there on a previous trip, we can also recommend it as a more luxurious place to spoil yourself in the area. There are ruins of the castle here, beautiful gardens and a lovely view of the gap with the blond ponies grazing in front of it. Breathtaking!! Then it was off to Killarney for a bit of shopping. As evening approached we had reservations for the Liam O’Connor show at the Killarney Avenue Hotel so we had dinner there and went to the show. And what a hand clapping, toe tapping show it was. Liam has the fastest fingers in the world on the concertina and his wife Lisa has a beautiful voice. The dancers and musicians were top notched, with experiences ranging from touring with the Lord of the Dance group to playing with Guns and Roses. What a fun night! When morning came we drove to Ross Castle on the beautiful Killarney Lakes, explored that area, then drove a little further on the Ring to the Torc waterfalls, This proved to be another picturesque spot allowing Anabel to take in the biggest waterfall she had ever seen. For lunch we headed to the Muckross house and gardens. Here you can tour the gardens, the beautiful historic home, take a poney trekking ride around the lakes and shop in the craft center. Anabel enjoyed shopping and found a tin whistle she could take home and play. The late afternoon found us returning to the Bunratty Folk Barn in the park for an evening of Irish food and musical entertainment (it is within a few miles of the Shannon airport). What a great way to end our week in Ireland, for sadly tomorrow Anabel and her mommy had to return to the states. We spent the night at the Two Mile Inn which allowed us to get to the airport quickly the next morning. And as we watched their plane take off our week of spectacular weather and sights had come to an end. The clouds moved in and we experienced a very Irish day.